The third, and perhaps best, rendering of 110 in the Shade is now available thanks to PS Classics. The 1963 original cast recording features the sweet soprano of Inga Swinson as Lizzie. The score was again recorded again in 1999 and featured Karen Ziemba as Lizzie. It is a recording to own if you are a completist, but especially if really want to experience the glorious score by Harvey Schmidt. While the two previous recordings are wonderful, this is the recording to own. 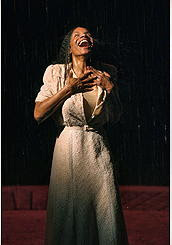 Audra McDonald owns this Lizzie with her powerhouse soprano. She's not a belter or operatic, she's just transcending. I'm telling you, it just doesn't get any better than Audra.